If you're a wheelchair-bound subway rider, getting around can be a challenge. A new map shows just how hard it can be. Matthew Ahn, 24, a lawyer by day and a mass transit hobbyist by night, plotted out the city's subway system, removing all stops that are not wheelchair accessible. He recently published the map on his blog. Ahn currently holds the Guiness World Record for hitting every stop in the MTA subway system in 21 hours, 49 minutes and 35 seconds. It's a record that a pair of Englishmen recently attempted to top, but were thwarted by subway delays. Of the city's 490 subway stops, less than 100 are wheelchair accessible, according to Ahn who said he was surprised to learn that the MTA didn't already have a map that isolated wheelchair accessible stops. "It's all on the main map and it doesn’t look great," he said. Ahn started working on the map in January and finished it up in his spare time by the end of February. He hoped it would draw attention to what he called an often-neglected civil rights issue. "It's something that's under appreciated," he said. People are familiar with issues surrounding race, gender, LGBT and mental health rights, but disability rights, not so much, he said. "[I wanted to make] a single graphic to show people what the situation is," he said. Examining his map, it's clear the situation is pretty grim. 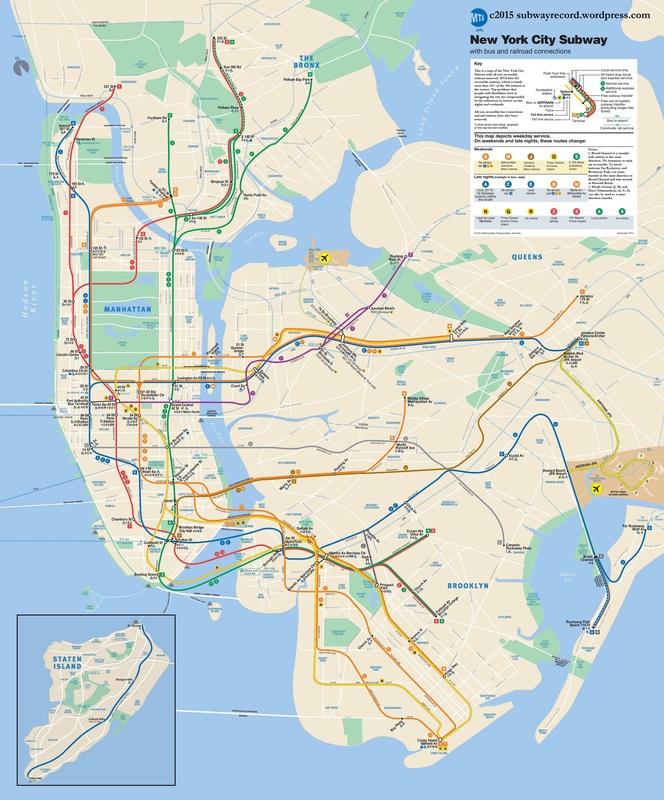 In Brooklyn and Queens, the J train only makes three accessible stops: Marcy Avenue, Flushing Avenue and Jamaica Center. The D and R trains don't make any stops between the Barclays Center and Coney Island in Brooklyn. The 6 train makes just two stops in the Bronx, once at Hunts Point Avenue and then at Pelham Bay Park. The MTA recognizes the infrastructure shortcomings and has other kinds of para-transit to make up for the dearth of subway service - buses are wheelchair accessible and Access-a-ride can help fill the transit void. Though bus routes are designed to compliment the subway system, not replace it, Ahn pointed out. Ahn said he recognized that the city's transit system is over a hundred years old, and updating the aging and unaccessible infrastructure would take massive political will and capital. "At a certain point you can’t just say, 'Oh well, the system is old' and then not do anything," he said. "We have to find a way to modernize the system."